After 3 days of sleep and sickness, Thursday was my first opportunity to get myself out of the house and back into the swing of Paris. Despite having eaten about 12 calories in 72 hours, I was determined to get the school run done, drive to the station and get the train to Paris Nord to go and meet Laura off her own train from La Rochelle. It’s fair to say I was a bit shaky when I got there, and I could hardly speak due to my sore throat, but there was no way I wasn’t going to see one of my best friends on her arrival into the city I’ve (almost) called home for the past 3 months. 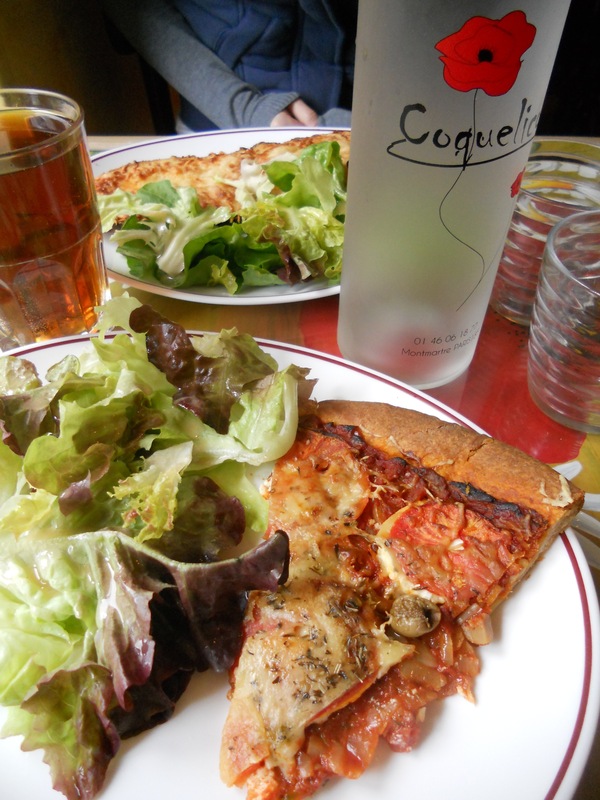 I took Laura to Montmartre and to my usual haunt – the Coquelicot Cafe. In hindsight, going to the only place in Paris that requires walking up steep hills when I’ve not eaten anything was probably not the best idea. Anyway, we had a lovely lunch there and I even managed to get some solid calories (a slice of pizza and two lettuce leaves) down me. 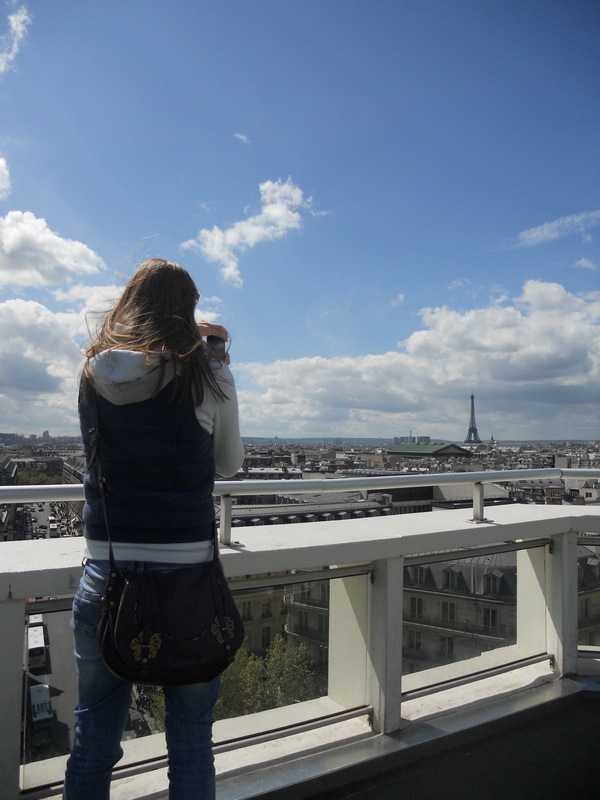 As Laura’s already been to Paris and seen all the typical sights, we decided not to spend the afternoon trekking down the clichéd route between the Eiffel Tower and Notre Dame and instead headed up to the rooftop of the Galeries Lafayette. I came here only on Saturday with another friend so knew it’d be a good spot to have a sit down and see all the sights of Paris from one location. Plus the day was a lot clearer than the previous visit so I was able to get a few better photographs of the fairly impressive skyline. By this point I was starting to flag a bit so our next move was to hop back on the metro towards Chatelet – and towards the gelateria I have mentally mapped in my mind. A pot of strawberry sorbet later and my sore throat was feeling considerably better. 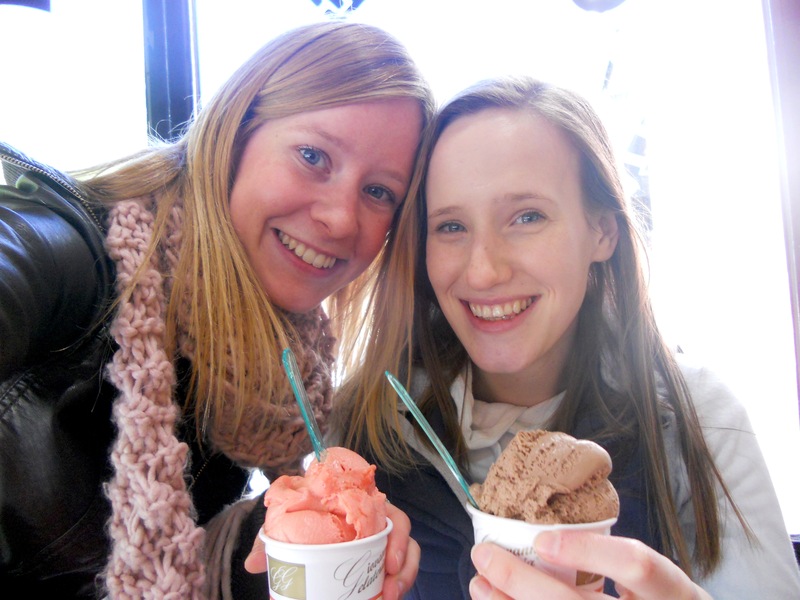 Laura tried the local delicacy Nutella ice cream too. Unfortunately I then had to leave her to get back home in time to pick the boys up from school – but I’m more than sure she spent the rest of the day doing suitably cultural activities. Laura’s in Paris until Saturday (when we’ll both take the same flight back to England) so I’ll be seeing her again on Friday for my very last day here. Let’s just hope that I’ve left enough petrol in the car to last me one more trip to the station!